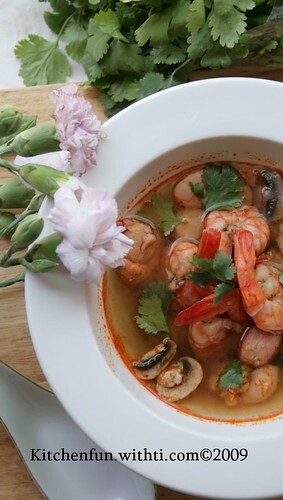 This month Menu is Tom Yum soup, once more i participated this event called "Masak bareng" or cooking together, with the same menu, and same day we posted the food pictures. So far i always try to follow the event. The hosts are Indonesian women too, there are Deetha in Semarang- INA, Ayin in Norway and Shinta in Japan. Sometimes we had difficulties finding the specific ingredients, because we live far away from our country, but we never give up, trying to make Indonesian food as authentic as possible, using the substitute and try to be creative :). I used tom yum paste this time and bought the fresh marinara from fish shop. 1. Place noodles in a large heatproof bowl, pour over boiling water to cover and soak for 5 minutes or until softened. Drain and set aside. 2. Stir paste in a large saucepan over medium heat for 1-2 minutes until fragrant. 3. Add stock, bring to the boil, then reduce heat to medium-low, add beans and mushrooms and simmer for 1 minute. Add prawns and cook for a further 1-2 minutes until prawns are just cooked. 4. Place noodles in bowls and top with tomatoes. Pour over soup, garnish with coriander and serve with lime. 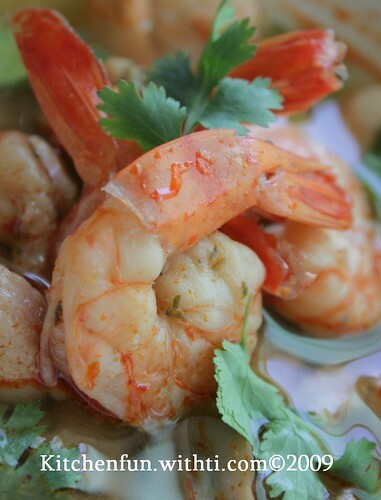 * * Tom yum paste is available from Asian and selected supermarkets. delicious. - August 2004, Page 143 revised by Ti.